My favourite medieval fruit is baaaack! Two Saturdays ago, across the crowded farmers' market, I found them. I'd been asking around since September, and then I was just standing at the fruit stand, about to buy pears, when I saw it: a basket of homely and bumpy quinces. Have you ever seen an uglier or more beautiful fruit? I don't think I actually jumped up and down (although it's certainly possible), but my excitement must have been fairly obvious because the girl next to me asked me what I was so excited about. So I waxed rhapsodic about quinces and I do believe I converted both her and the nice young man selling the fruit to this fuzzy-rock-hard-magical fruit. I went a bit wild about quinces last year and the mania continues. You see, they start as beige-coloured woody pieces of flesh that you have to hack off with your sharpest knife. But then, in the boiling water, they transform into tender pink (pink!) pieces of perfume-y soft fruit. And their cooking liquid goes from clear to pink to ruby. Last year, I gave you the recipe for quince almond cake and threw in a line about how you can just add a bit of extra sugar to the cooking liquid once the quinces are poached, forget about it boiling on the stove while you eat dinner, and suddenly you have a kind of firm quince jelly. Well, I do understand that wasn't the most helpful instruction ever so I thought I'd make it a bit more scientific. 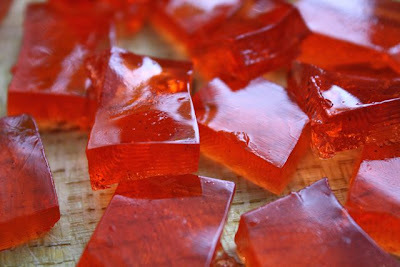 I can now give you exact proportions and times to make quince jellies – because, let's face it, eating dinner might take a different amount of time at your house. 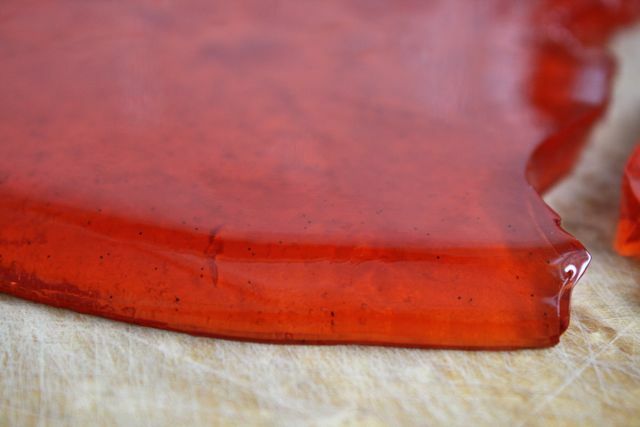 The jellies have a lovely set that is firm but as smooth as a lake on a clear day. The taste is hard to describe because it's so very quince: perfumed with a sort of tang that is unlike any other fruit. 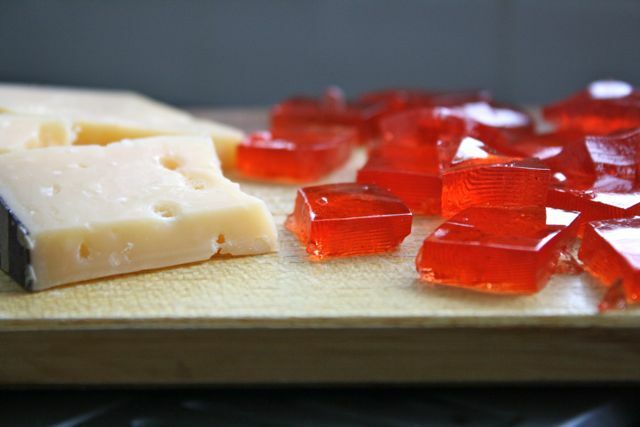 We like eating the jellies neat for dessert, and also with crumbly sharp cheese on a cheese board. Their clear red colour is stunning – especially when you think about how you started with ugliest pieces of beige fruit known to man. Rinse the quinces in warm water and use a cloth to gently rub off their fuzz. Then, take out your biggest and baddest knife and sharpen it – quinces are hard like wood. Once you've sharpened your knife, set it aside and get out your vegetable peeler. 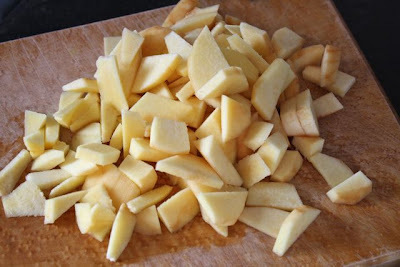 Peel the quince, then use your sharp knife to cut around the core and make pieces in the size you like (I like 2 – 3 cm squares). Put the quince in a big pot and cover with 1 litre of water. Cut your vanilla bean in half and use a small knife to scrape out the seeds. Deposit these seeds and the bean pod in the water. Stir in the 80 g. of sugar. Bring to a boil. Simmer, covered, until the quinces are pink and soft, about an hour and a half for me, possibly longer for you. They should yield easily to a sharp knife and be edible at this point. While the quinces are poaching, get out a big bowl and two strainers*: one regular pasta strainer and one fine-mesh sieve. Place the big strainer over the big bowl. Once the quinces are soft, strain them over the bowl. Set aside the fruit for your next cake or breakfast** (removing the vanilla bean). Wash the pot the quinces were cooking in to get rid of any extra grainy matter. Rinse it well! Set the fine-mesh sieve over it and strain the cloudy liquid through it. Now you should have clear liquid in the clean pot. Stir in 160 g. of sugar. Boil uncovered over medium-low, stirring when you feel like it. At first, the bubbles will be small and pop up from the bottom. While you're waiting, get out a shallow pot (about 20 cm or 8 inches). Set it nearby. 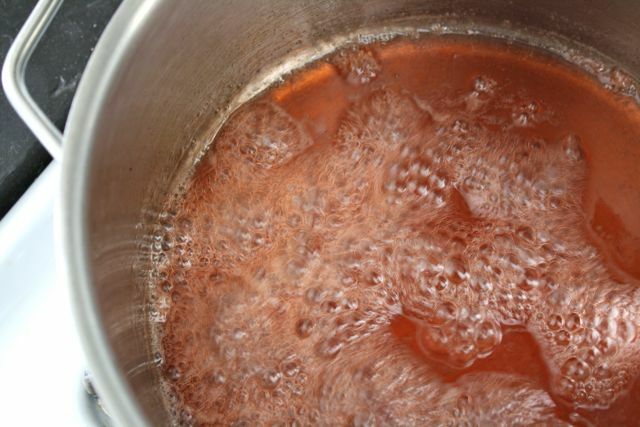 When the liquid is ready, in about 20 minutes***, it will suddenly be darker and bubbles will be big and tangled and overwhelm the liquid. Pour it into the shallow pot to stop the cooking process. Wait about 20 minutes, until it's completely cooled and firm. Run a clean butter knife around the edge and invert it (with a bit of help) onto a plate. Use that butter knife to cut it into jelly pieces. Serve alone, as dessert, or with a crumbly sharp cheese, like very old gouda. You may keep it in the fridge in a sealed container for a long time. *If you have a large fine-mesh sieve, you can skip the first strainer. My fine-mesh sieve is too small to hold all the fruit. 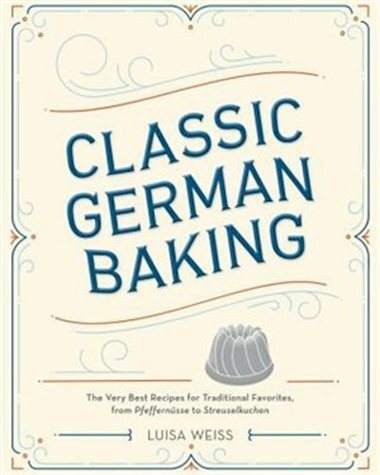 *** If you double the recipe, it may take twice as long. I don't think I've ever eaten quince at all, but these jellies look fabulous! Must try! They look gorgeous and must taste wonderful! 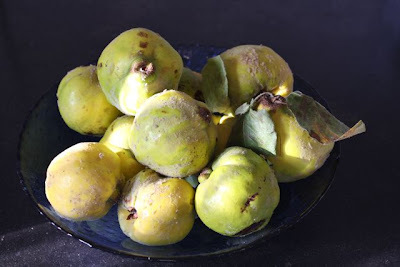 Merci, Clotilde -- and thank you for introducing me to quinces and the idea of poaching them! 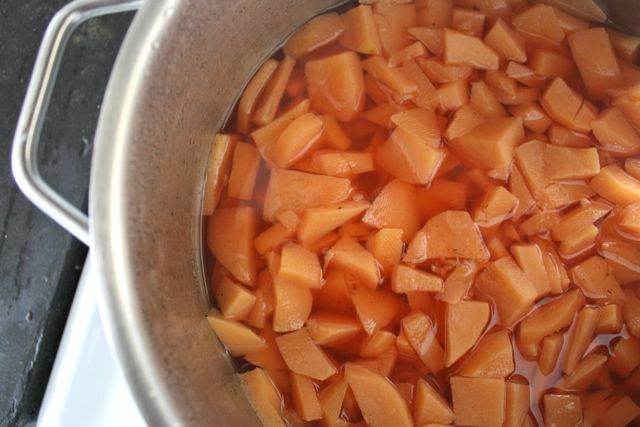 We just spent the afternoon tracking down quinces to make quince jelly--who knew they were so hard to find!!!! Finally we did and they smelled so delicious poaching in the oven--can't wait to see the end result. Knowing you and your refined tastes, I do think you'll like them. They're so distinctive -- I'm curious what you think about them. And way to go for tracking them down in Kelowna! P.S. Don't you think the quince is *the* ugliest fruit ever? I love that about it. 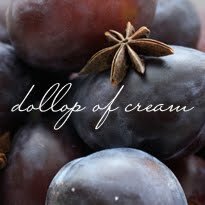 Very similar to dulce de membrillo which is a traditional Argentinean dessert served most often with cheese. So yummy! Yes, I was struggling with what to call these . . . From what I understand, membrillo involves using the whole fruit (in a sort of purée), whereas this is clear and smooth. But I'm sure the flavour is very similar. After all, if it's quince, you just can't go wrong!